Texas Family Code Section 54.02 gives the juvenile court the power to transfer its exclusive jurisdiction over a juvenile case to a district court. This transfer of jurisdiction allows the State to treat a juvenile as an adult for purposes of prosecution. Section 54.02 actually lays out two different processes for transferring juvenile cases to adult court. The first process is used in cases where the juvenile is under the age of 18 at the time of certification. The second, which is laid out in Section 54.02(j), is for those cases in which a person has turned 18 prior to the filing of the case in juvenile court. 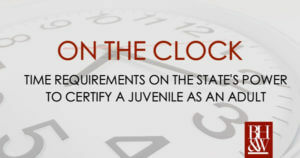 The Texas Court of Criminal Appeals recently upheld the time requirements placed on the power of the State to pursue post-18 certifications in Moore v. State (Case Opinion – 2017). This section of the Family Code imposes on the prosecutors a duty to pursue cases in juvenile court whenever possible. In order to retain the power to prosecute cases after a person has aged out of the juvenile system, the State must show that the delay in prosecution was beyond its control. If it is unable to prove this, then the only choice available for a juvenile court in these situations is to dismiss the case. In Moore, the accused was charged with Aggravated Sexual Assault of a Child. He was alleged to have committed the offense when he was 16 years of age. Due to a heavy caseload and an error in one of the police reports, the detective did not send the case to the District Attorney’s Office until after Moore had turned 18. The prosecutor filed a certification petition in the case over a year later when Moore was 19 years old. The juvenile court transferred the case to district court. Moore pled in adult court and received 5 years’ probation on a deferred adjudication. He then appealed the case claiming that the juvenile court lacked the jurisdiction to transfer the case because the State did not prove that the delay in filing the case was beyond its control. The State first claimed that law enforcement should not be considered “the State” under Section 54.02(j). The State then argued that the court should consider whether the reasons for the delay were unconstitutional. According to this argument, if the reasons for the delay were not in violation of Moore’s constitutional rights, then the State should be allowed to proceed with the certification regardless of who was to blame for the postponement in filing charges. After considering the arguments of both sides, the ruling of the Court of Appeals, and the case law presented by the parties, the Court of Criminal Appeals ruled on the case. First, the Court held that the term “the State” includes law enforcement and prosecutors collectively. The Court pointed out that the law consistently includes law enforcement in its use of this term. The Court then dismissed the State’s notion that the requirements of Section 54.02(j) be treated like a claim of speedy trial, due process, or statute of limitations. The Court explained that the reason for the requirements in Section 54.02(j) is to limit the power of the State to prosecute a person as an adult for something that happened when he was a juvenile. In order for an exception to be made to this general rule, the State must prove that it was not at fault for the delay in prosecution. The Court of Criminal Appeals’ decision in Moore is consistent with the Texas Supreme Court’s rulings in other cases involving juvenile certifications. The courts are clear that juvenile cases should be handled in juvenile court when possible. This means that detectives and prosecutors working juvenile cases must be diligent in giving these cases the proper priority so that an accused juvenile does not age out of the system before his case can be heard by the juvenile court. In any case in which prosecution is delayed until after a person’s 18th birthday, the State will be required to prove that the reason for this lag time was beyond its control. And if the State is unable to meet this requirement, then the courts will prevent further prosecution in these cases.